This has been a relatively big year for the Australian Medical Community in the Social Media World. We've seen a number of large campaigns kicked off by Australian Doctors and medical students such as, Jill Tomlinson with #DestroyTheJoint and the #InternCrisis campaign. There has also been plenty of online education initiatives sprouting and growing as well from Australian soil. Most notably the Global Medical Education Project and the #FOAMed revolution, led by Mike Cadogan (@sandnsurf) of LifeintheFastLane.com fame. Most notably however in my personal view, has been the rapid uptake of social media this year by the Australian Medical Community. I've been on twitter now for well over three years and the numbers of medical students and doctors I've seen join this year has been astounding. Which leads to my next thought: Where is the hashtag, the community, the online forum for the Australian Medical Community? The Online Australian Medical community has grown to a point, where it would be great to have a clear place to raise and share issues online. Having been involved as a Facilitator of the #HCSMANZ hashtag, I have many ideas on what I think would work and what wouldn't. But perhaps more importantly, I recognize that for a hashtag to truly work and grow, there has to be engagement and a sense of community. Here is the part where you come in. 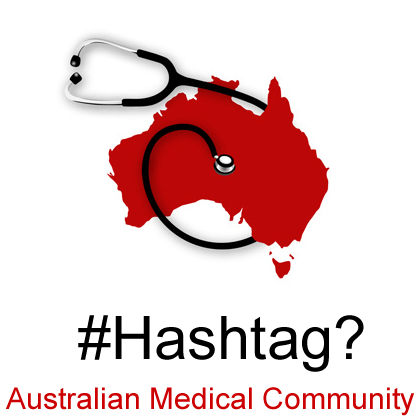 I would like to have a hashtag created for the Australian Medical Community, that represents as best as possible, people's interests and what they would like to see in the hashtag. Hope to see many people taking part in the creation of this hashtag so that we can come up with something that works best.